Two weekends ago we decided to do our door molding. When we ripped out our base molding, the door molding went along with it. Why - the previous owners of our condo didn't think matching the molding was important. We literally had three or four different sizes of door molding and floor molding. It was terrible. When we brought Morgan home there were several areas of exposed drywall... he LOVED the drywall. I was forced to spray the drywall everyday with BitterApple so he wouldn't get sick. 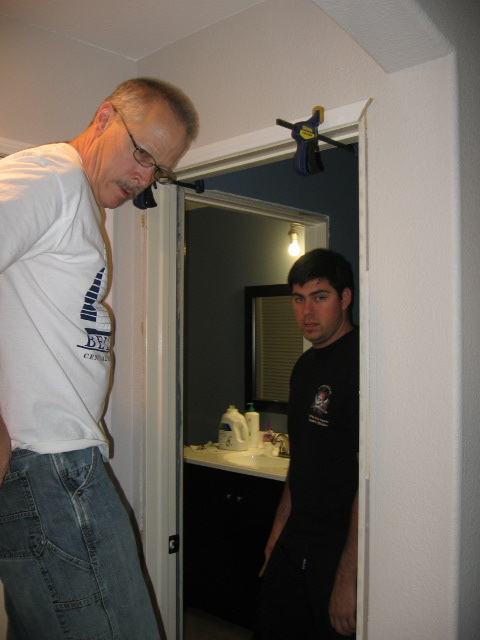 After a SOS phone call to my dad, he and Mike installed the door molding. Dad & Michael Working Away!